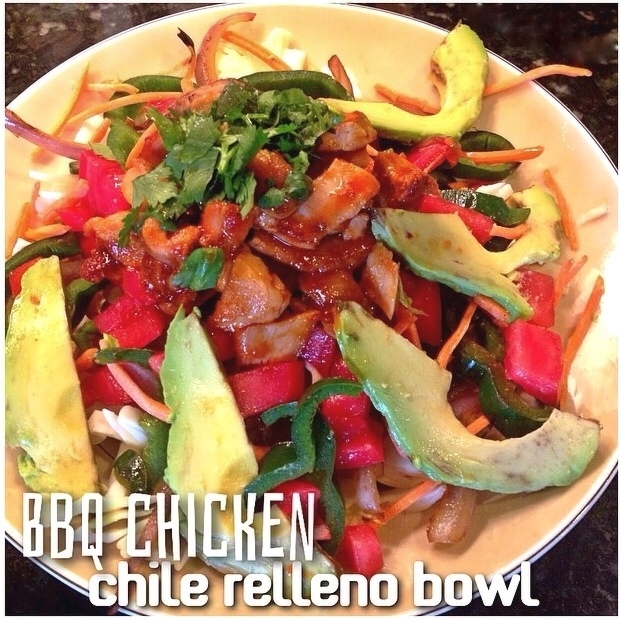 Low carb BBQ chicken bowl with lots of veggies and protein. Heat a nonstick over medium high heat and add tsp olive oil. Saute chopped red onion and poblano pepper and sautÃ© until onion is translucent and pepper is soft. Remove veggies from pan. Cut chicken into small pieces and add chicken to pan. Cook 5 minutes or until chicken is fully cooked. Toss cooked chicken with BBQ sauce. Layer in a bowl 2 cups shredded cabbage, sautÃ©ed veggies, then tomato, carrot, and BBQ chicken. Top with 1oz sliced avocado and cilantro.